The government has announced the route for the second phase of the high-speed rail line HS2, from Crewe to Manchester and the West Midlands to Leeds. It does not include a final decision about where to locate a new station in or near Sheffield. The announcement confirms ministers' commitment to push ahead with the controversial £56bn project, which they say will boost the economy. 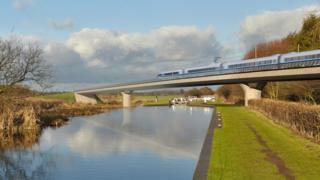 Critics say HS2 is not needed and will spoil parts of the countryside. The announcement removes much of the uncertainty over the project, except over where to site Sheffield's station - a decision on which is expected next year. The government's preferred option is for the main HS2 route to run east of Sheffield, with a separate spur to take passengers to Sheffield city centre. This would cost around £1bn less than the alternative suggestions - which involved taking the main HS2 line through Sheffield city centre or to a new station at the Meadowhall shopping centre just outside Sheffield, near the M1. Another spur will take HS2 to a new station at Manchester airport. The first phase of the £56bn railway is due to open in December 2026, with trains to travel at high speed between London and Birmingham before continuing on the existing West Coast Main Line. The second, Y-shaped phase is due to be completed by about 2032-33. Now that the government has confirmed most of its chosen route, it will go through the parliamentary process. Transport Secretary Chris Grayling said support and compensation would be available to those affected by the project, who can begin the process now by contacting HS2 Ltd. The Department for Transport says compensation will be calculated at 110% of the value their home would have had without any plans for HS2. Anyone living within 60m of the route is entitled to compensation, although the DfT said that could be extended in certain circumstances and wasn't "a hard and fast rule". Nevertheless, communities along the proposed route in South Yorkshire are still voicing strong objections. Among them are residents of the newly built Shimmer Estate in Mexborough, which is likely to be demolished to make way for the new rail line. Resident Russell Holmes said: "It may be a new estate, but it's a proper community. For that to be destroyed is devastating. "But the uncertainty, waiting until it happens, when you can actually put something in place to move, is horrible as well." The area's MP, former Labour leader Ed Miliband, said he would oppose the planned Sheffield part of the route, saying it "flies in the face of evidence, logic, value for money and the needs and interests of local people". He added: "This is the wrong decision for South Yorkshire, wrong for Doncaster and wrong for the residents who will see their homes destroyed and communities blighted." Jonathan Pile, of campaign group Yorkshire Against HS2, said the proposed route was "unsuitable, should be struck out" and was "unfit for purpose". Pressure group Stop HS2 said that once the high-speed railway was operating, existing intercity services to London would be reduced by up to two trains an hour. The group's campaign manager, Joe Rukin, said ministers were "trying to con the public" that the high-speed line was needed to boost rail capacity. "The government have finally come clean in admitting 'freeing up capacity' means for many cities 'losing the trains you already have', as the HS2 business case demands £8.3bn worth of cuts to existing services," he added.